There are 43 items in this list, view them all as images ? Made in Czechoslovakia. 1963 archtop fitted with Japanese single-coil pickups disquised as humbuckers. Currently with flatwound strings. Recent fretwork and set-up. With original groovy vinyl gig bag. Made in Germany. 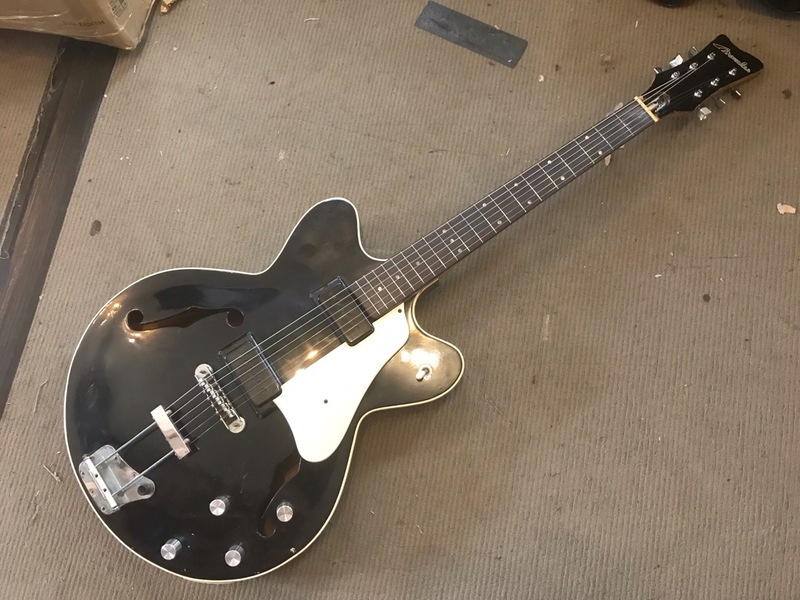 1963 hollow body electric with bolt-on neck. Made in Japan 1990s, mahogany with bound rosewood fretboard, with added humbucking pickup and super luxury gig bag. 2014 Hollow body Electromatic. Bigsby. Make in Korea. Includes case. 2009 Casino. Special release - Inspired by John Lennon's 1965 Casino! Super Axe! 1979 Made in Japan. * Removed pickup and parts are included. 1960s Made in Japan by Zen-On. Very cool bolt-on neck archtop hollowbody. P-90 style pickups. 2013 50th Anniversary reissue of the classic 1962 model. Number 1182 of 1962 made! Vintage 1976 Made in USA! The famous offset hollowbody that was Fender's answer to the Gibson ES-335. ALL ORIGINAL CONDITION! In excellent condition for a guitar of this age! Features 2 x Seth Lover CuNiFe Wide Range Humbuckers, High Quality 1 Meg pots and Master Volume. Comes with original Hard Shell case and includes original factory brochure and hang tag! 1962 Collection Reissue Sorrento! Made circa 2012 - 994 of only 1962 Made! Excellent condition! Stock Gibson USA mini humbuckers, Wilkinson Deluxe Tuners - and deluxe Epiphone Hard Case and case candy. Enter your email address below to get alerts for Hollowbody electric.